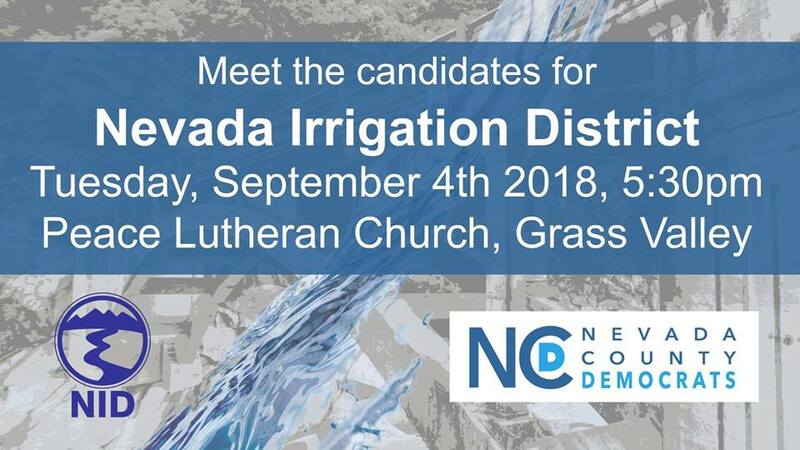 Please join us at 5:30 p.m. on September 4th, at the Peace Lutheran Church in Grass Valley to learn about your district, what NID does to protect your water and the water shed, and the candidates running for the 3 open seats. A $5.00 donation is requested. The Nevada Irrigation District (NID) goes relatively unnoticed as an entity in Nevada County even though its budget is the second largest in the county and it employs 205 people. The decisions its board makes have a profound impact on the citizens of Nevada County. It is responsible for managing the water shed and delivery of water for agricultural purposes, as well as urban needs. It is responsible for the Scott’s Flat and Rollins Lake reservoirs and maintaining the lines of delivery. NID is governed by a five-member Board of Directors, elected to four-year terms by district voters. The board is the district’s policy-making body, and policy is carried out by approximately 205 full- and part-time employees. This November, three of those seats are up for election. This November we have an opportunity to elect three qualified individuals who will be more transparent, innovative, and collaborative with local organizations and the public. Members of the board are elected from within and represent five geographical divisions within the district. See map. Directors are compensated per guidelines set in the California Water Code (Section 21165, approximately $14,500 per year plus medical benefits). Although there is a monthly board meeting open to the public, the decisions made by the board are largely done behind closed doors. This has been true of the “proposed” dam project. Potential issues: Forced sale of homes along the Bear River; use of BLM land to be used to build a dam — a request was made to LaMalfa — a friend to big business, not NC citizens. This was done before a public hearing. The amount of money it will cost to build is unclear, as is who will pay for this project. The water captured from this dam will potentially go to the Lincoln area and south of the Lincoln area, and not the citizens of Nevada County. There is also the unresolved issue of Nissenan sacred land that will be flooded in the process of building and filling this dam.